Born into media, Jeffrey Wolinsky grew up in a family-owned and -operated full-service advertising agency where marketing and advertising were part of the menu at the dinner table. For the past 17 years he has worked with hundreds of local and national companies on creative media concepts and execution. Jeffrey currently is a director of federal and national sales for WTOP and Federalnewsradio.com. WTOP is the number-one revenue-producing radio station in the country and has evolved from a radio station into a digital news organization that currently provides outreach to its massive radio, digital, and social audiences. 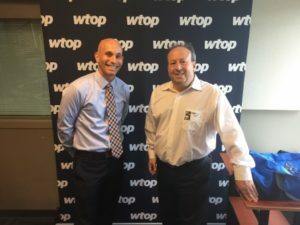 In addition, it offers external digital services to its clients so that WTOP can provide marketing services beyond its proprietary audience, helping clients target any audience through digital marketing. He’s a certified facilitator of the creative problem-solving process and a five-time finalist and 2013 winner of the National Sales Manager of the Year Award presented by Radio Ink, a leading trade publication. A graduate of University of Maryland’s Robert H. Smith School of Business, Jeffrey coaches youth sports and cheers on Maryland basketball; he brings his three sons along with his wife to as many of their games as possible. Fred Diamond: Just a little bit of disclosure, I personally have been a customer of WTOP over the years throughout my career. I used to be the marketing director for Compaq a long time ago, and we had done a lot of work. Microsoft had been a large client of mine over the years, and we had tapped into some of the great resources available from WTOP and Fed News Radio. Let’s talk about your career. How did you get into sales as a career? Jeffrey Wolinsky: I knew that I wanted to be associated with the media based off my history, and from there I took a strategic approach at a young age and did internships at radio stations. I did an internship at a TV station. I did some research in the outdoor-billboard community, and when I was at the University of Maryland I actually sold the ads in the newspaper there. They had a newspaper called the Diamondback Newspaper that printed 19,000 copies a day, five days a week, at that time the third-largest college newspaper in the country. For three years I worked there selling the ads. People thought I made a lot of money, but it was really a passion of mine, where I was making more than people who were working at restaurants and I was able to work on campus and make an impact on the university. It was a phenomenal time in my life. 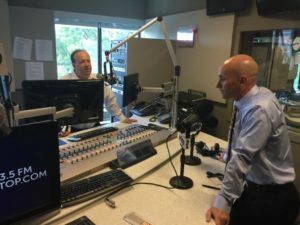 Fred Diamond: For people who are listening, who aren’t in the Washington, D.C. [area], WTOP has historically been pretty much the go-to place for companies that want to advertise. For those of you who aren’t really familiar with the geography here, there’s a lot of time people spend in cars. There is what’s known as the Beltway, and it’s not uncommon to have commutes of an hour, hour and a half to get to or fro. WTOP is the station that people almost invariably listen to a number of times throughout the day. I’m curious to hear some of your journey, especially now that, as we mentioned in the intro, WTOP is not just selling radio time, airtime, you’ve also branched into the digital marketing space. Why don’t you tell us a little bit about what you sell today and what excites you about that? Jeffrey Wolinsky: There are two really cool parts to that. In one aspect, what radio stations sell today is similar to what they sold in the past, and that’s the ability to influence the people who are listening. The approach that we take is that we want to have a theater of the mind and change the way people feel about your business. What we have the opportunity to do and what Hubbard, our parent company, has done really smartly is create an opportunity for our clients to go beyond our proprietary audience. What do I mean by that? In today’s day and age, consumer behavior would be if you hear about something, see something, told about something that you’re interested in, what’s your next natural step? That next natural step is typically to pick up your iPhone, our minicomputer that’s in our pocket, and do research through the Google machine. You look into Google, and then what happens? Today we’re able to service a full suite of marketing products, from getting people interested in your product through the radio or through our website at WTOP.com but then taking them through the full consumer journey, whether we’re managing your social media profiles, whether we’re actually buying your pay-per-click and managing that account on Google, doing SEO, email marketing, any number of other things, what YouTube video—all kinds of aspects of the marketing funnel. We’re able to help our clients not only drive interest in their product but actually see it through to the funnel, even to the final point of attribution for the full conversion to a sale or a filled-out form or something that is the ultimate goal that the advertiser is looking to fulfill. Fred Diamond: That’s great. As we’ve been launching the Sales Game Changers Podcast, I’ve been talking to some of the top sales leaders across the country, and one theme that’s come across is they’re not just focused on their customer but they’re focusing on understanding their customer’s customer and how their customer can achieve more goals. I think the evolution we’re going to hear today about what WTOP now offers to customers is just wonderful in that regards. You mentioned that one of your first sales jobs was selling for the University of Maryland newspaper, with a circulation of about 19,000. What were some of the key lessons you learned from those first few sales jobs that have continued with you to this day? Jeffrey Wolinsky: I think the thing that a lot of people don’t understand about sales is the person who gets the most “no”s is probably the most successful. Sure, there’s that rare person out there who just has an unbelievable closing ratio and gets all kinds of yeses, but sales is an effort game, and if you’re not out there hearing no from people it means you’re not actually out there talking to enough people. Finding clients, having conversations, and coming to the conclusion that some of those people don’t buy from you is okay. You just need to have more relationships and always be finding new ones because the consistent theme about any podcast, conversation, life, is that things change. So establishing relationships with people who might give you no might only be a no for now. Having that relationship that starts where you understand their business, you research their business and become valuable to them, could result in no for now, which becomes yes at a later point in time. Fred Diamond: Along the way, who were some of the sales mentors you’ve had who have helped you get to this point and help you understand the value you’re bringing as selling professional? Jeffrey Wolinsky: I think so much of my sales career is dedicated to WTOP and the leader of the WTOP sales organization. Matt Mills has had a profound impact on me, both our personal and our professional relationship. I think there’s an aspect of how we both approach our professional career, how we approach our clients, and how we approach the aspect of adapting to new and changing technology and views. That would be the first person I’d mention, because the success that we have here has been from his long-term view, his ability to let people experiment and grow, the consistency with which our sales organization has been: All of those things have led to our success. I would mention two other people. One would be my dad, because I look at my dad as somebody who really always focused on work, and when I think about my childhood I didn’t see a distinction between personal and professional life. Work was always part of who we are and what we did. The work ethic and the ability to give people ideas, because ideas are what get people motivated. Ideas are what get people excited, and ideas are ultimately what drive people to buy because of the emotion that those ideas create. And then, the last one would be the collection of books, tapes, CDs, podcasts, the sales world in general, that drives information to us as people who are out there seeking the ability to grow and get better. Fred Diamond: We mentioned in the introduction that you came from a marketing and media family. Is your father still in the business, or has he retired? Jeffrey Wolinsky: He luckily retired. It wasn’t something that he probably thought was going to be the case. He probably thought he would work until the day that life ended, but I think the great part was he was working for a company after he closed his business. The company got acquired, and it became a natural progression for him to experience retirement. That was almost one year ago today, and we’re in a situation where he’s got to experience the second phase of his life. He worked from literally 16 years old to 70 years old, and I think that he put in his dues and really deserves the opportunity to experience retirement and focus on himself. Fred Diamond: Jeffrey, what’s the number-one specific sales success or win from your career you’re most proud of? Take us back to that moment and that experience. Jeffrey Wolinsky: The most successful thing that I find is not a new sale. It’s a renewal sale. And so, when I look at our experience at WTOP, we did a 10-year study on our advertiser base, and what we found in that 10-year study is the people who invested with us at the key account level were at a 91% renewal ratio, but the people who invested with us at a test level were at a 25% renewal ratio. For me, the biggest success in sales isn’t bagging an elephant, as I’ve read that book, but it’s focusing on getting a repeat sale. I think about all of the news that we cover, and we’re covering politics in a massive way. The biggest focus here is that our clients vote just like the general public votes for a politician. Our clients vote for both us and our product, so the thing that I’m most proud of is each time a client renews a sale that we’ve made in the past, because we provided value or gave them something that they wanted to get more of. Renewals are the biggest thing that make us happy. Fred Diamond: That’s great. It’s also great to work with a company where you know the quality is going to always be there, and it’s been there for, I don’t know how long WTOP’s been around. Fred Diamond: Fifty years, and time and time again the station delivers, and I’m sure that’s carried over to the other channels such as social, as we talked about before. Jeffrey, you’ve had a great career in sales, 17 years I believe, here at WTOP. Did you ever question being in sales? Was there ever a moment where you thought to yourself, “It’s just too hard” or “It’s just not for me”? Jeffrey Wolinsky: No. I knew sales was for me, but there are things that every person should question about where they work and what they are. We’re in a free-agent society where my belief is that in any relationship, whether it be with your wife, your employer, your neighbor, your friend, somebody at your religious organization, over time that relationship needs to be a 50/50 balance. There are days, weeks, months where it might be 60/40, 70/30, but over time it needs to balance out as 50/50. And so, when you look at the requestioning of “Am I in the right place?” you think to yourself, “Is the product that I represent consistent with how I want people to see me?” There are some radio stations in America right now going through a crisis in the way that their salespeople don’t have relevant products to sell that deliver an audience they can be proud of and deliver return on investment for advertisers. In 2002 when I started here as a local salesperson, and then again just last month, I met with two different advertisers that were trying to achieve the same thing: phone calls with qualified leads to purchase their product so that the investment that they made with advertising would deliver a return on investment with more sales for their company. These are both in the home-improvement category. In 2017 the product that WTOP delivers is just as good, if not better when you include the digital capabilities, as it was the day that I started. And so, the question “Should I still be here and representing this product as a part of who I am as a person, as a part of my legacy, and as a part of what my career is and will continue to be?” was answered by my clients as they continue to get results from what I represent and what I sell and deliver to them. Fred Diamond: Jeffrey, I want to get some tips from you for the sales professionals listening on today’s podcast. 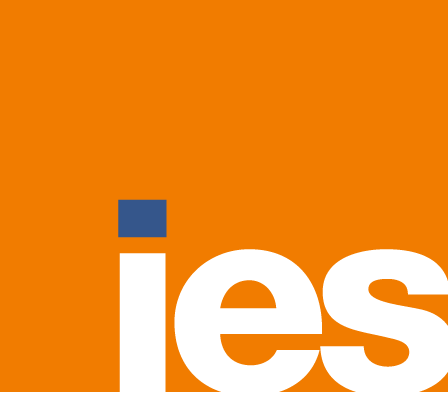 What’s the most important thing you want to get across to junior selling professionals to help them improve their career? Jeffrey Wolinsky: There’s something that I think about all the time and I’ve kind of coined it as “documentation versus presentation.” We’re in a day and age of big data. Everybody is tracking metrics, and all of those things are fantastic and great. We’re at a day and age where people are talking about millennials all the time and what they can do and show. However, we’re also in an age of distraction. How do I document all of these great things but at the same time present them? While these two words sound familiar… they’re very, very different. Documentation is something that I have as a leave-behind. Presentation is the feeling. Presentation is the belief. Presentation is the way that I deliver to you what I was providing to you that you can later see in the documentation. Too often salespeople rely on the documentation as a crutch that turns the sales meeting into a piece that they don’t control. When you’re giving somebody documentation and their eyes are focused on either the screen with charts or numbers or information that you’ve handed to them on paper, you’ve lost control of the room. When you’re making a presentation there’s a theatrical nature. There’s an emotional transfer, and there’s the ability for you to fill that person with confidence in what you sold them. Documentation versus presentation: How does it impact your sales process? Fred Diamond: Interesting. What are some of the things you do actively to sharpen your saw and stay fresh? Jeffrey Wolinsky: I actively believe in role-playing the sales process. I can’t say that I was ever somebody who was huge in being involved in drama or theatrics, but what I found when it comes to sales is I enjoy playing both the role of the salesperson and of the client in advance of a meeting. I oftentimes left meetings saying to myself, “I wish I would have said this” or “I wish I would have responded as that.” When you think about sports, what do they do? They practice more than they actually play the game. Many salespeople think that the game is the most important thing, but the reality is every single athlete practices for far more hours than the games take place. For me, with both my own sales and the salespeople I coach and work with and go in front of clients with, practicing for the actual sales call is sometimes more important than the sales call itself. Fred Diamond: Jeffrey, I love that. We’re hearing so many amazing themes continue to come through on the Sales Game Changers Podcast, and that is one. What’s a major initiative you’re working on today to ensure your continued success? Jeffrey Wolinsky: I’m going to follow up “documentation versus presentation” with my next one. It’s called “words on paper.” Way too often we are putting words on paper in a creative writing exercise that doesn’t belong in the presentation. People learn through images and presentation. We could go to the largest company in the world, Apple, and look back at the way that Steve Jobs presented the iPhone, the iPod, any of the different products he’s come out with. Steve Jobs made presentations to the media and the technology world that had no or one word on each of the slides. He showed pictures and then explained what they meant and brought emotion and theatrical feeling to the presentation. They were few words on paper. If you have people reading while you’re supposed to be presenting, you are losing. Do not deliver presentations that are words on paper. Fred Diamond: Jeffrey, sales is hard. People don’t return your calls or your emails. Why have you continued? What is it about sales as a career that keeps you going? Jeffrey Wolinsky: I think that’s an easy answer for me. I actually got this from my grandfather, and I think they then turned it into a Successories card. I don’t know which came first, him or them. But I am certainly not the strongest salesperson in this organization or in the world. I am certainly not the smartest salesperson in this organization or in the world. But I control the one piece that only I can control, and that is my own personal efforts. And so, the idea behind sales being won or lost on what I do today is false. Sales are won and lost in how I end the day, and each and every day I end in the same way, which is I will continue to try to move my sales and my agenda forward again tomorrow. It’s the salesperson that quits that loses. It’s the salesperson that continues that will win because the finish line never ends. The finish line is always moving forward. As salespeople we always live in the future. When we make a sale it’s onto the next sale. When we make a sale it’s onto the renewal of the sale that we just made. We live in tomorrow. The salesperson that lives in today won’t be a salesperson tomorrow. The salesperson that lives in tomorrow will always be a salesperson. Fred Diamond: Jeffrey, I have to ask you one or two more questions. Again, you’ve been with WTOP for 17 years. It is a huge brand, not just in the D.C. world but in the media world, and I know that we talked in the very beginning and you talked throughout the podcast today about how the offerings have emerged and grown. What’s different between now and 17 years ago, when you first started? Talk a little bit about how your job as a selling professional has changed over the 17 years that you’ve been here. Jeffrey Wolinsky: I think the biggest change is the number of competitors that are out there. When you look at many companies today, some of them are even publicly traded companies. There are companies out there that are creating platforms that are driven by advertising revenue. Oftentimes these companies are losing money hand over fist. Whereas our company is well profitable and continues to be. But these guys are definitely fragmenting the market. Seventeen years ago there was radio, there was TV, there was print and the beginnings of the internet. The competition has changed, but the way that our company has adapted to that competition has also changed. Today we still represent our proprietary product, and it’s a hell of a product. You’ve done a great job describing the importance of WTOP to the local D.C. community and the greater national community in the way that we reach the government audience and key decision-makers on Capitol Hill, at the Pentagon, at all of the civilian government agencies that are making decisions there. WTOP also helps our clients to use digital capabilities to reach any audience. In the past it was “How can I help you reach my audience?” Today it’s “How can I help you reach your audience?”—your audience meaning the advertiser’s audience. That’s the biggest change. Instead of just selling my proprietary product, I’m helping you reach any audience. I’m helping you target that audience. I’m helping you track that audience. I’m helping you get attribution to your marketing dollar. Fred Diamond: I just have one more question before we wrap up. Going a little bit off script here, but you work for a big brand, WTOP. I have to imagine your brand recognition amongst business leaders in D.C. has got to be close to 100%, if not 100%, and also expanded into the nation with streaming and things like that. A lot of people who are listening on today’s podcast, they’re working for smaller brands. They’ve never had the opportunity to work for such a large, well-known brand. Is it easier or harder, do you think, knowing that WTOP has the brand recognition? Do the doors open and then you have to work harder, or do people think they know what you’re bringing? Jeffrey Wolinsky: It definitely is helpful that people know, trust, and respect our brand. Every sales organization has its own challenges. Some organizations are unknown, and that’s a challenge to them. Other organizations are known, but people can have preconceived ideas or notions. The reason I like being associated with WTOP is because for me, the product that I represent is a reflection and part of who I am, and so part of how I get positive affirmation about myself is when people say yes to the things that we present to them. Every day I get the opportunity for people to say yes to me to make me feel better. Every day getting to affect and impact and grow somebody else’s business makes me feel good about what I deliver. We have more than 1,000 clients, so each day is different for us. I can’t speak for other people, but for me, getting to do something different or dealing with different businesses and understanding different businesses has helped me grow as a person. Our focus would be to renew our existing accounts, help them grow by growing with us, and find new accounts. “Renew, grow, find”: Through that I get to stay friends with people, make those relationships with my friends deeper, and find new people to be friends with, all of which are people I can help. So when I think about sales, you have relationships with people you ultimately are trying to help. It goes back to the golden rule of treat other people the way that you would like to be treated, and that’s the philosophy of both me and the WTOP organization as a whole. Fred Diamond: Jeffrey, how can the audience reach you if they’d like to follow up? Jeffrey Wolinsky: I’ll tell any salesperson, the best way to reach somebody is through the phone because it’s not passive. We like to be aggressive. You can reach me through the phone anytime: 202-895-5018. Every salesperson should always answer their phone and have a customized message for when they don’t answer both their work phone and their cell phone.